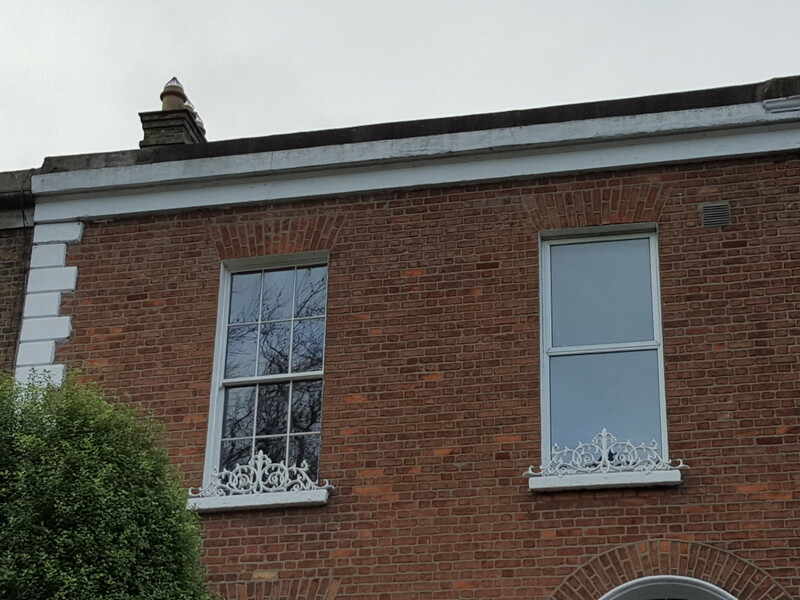 What began more than a year ago as a conservation report related to damage from water ingress swiftly became a refurbishment job intent on restoring the character of this Protected Structure, and on giving it the kind of general facelift befitting the clients’ love for their home. 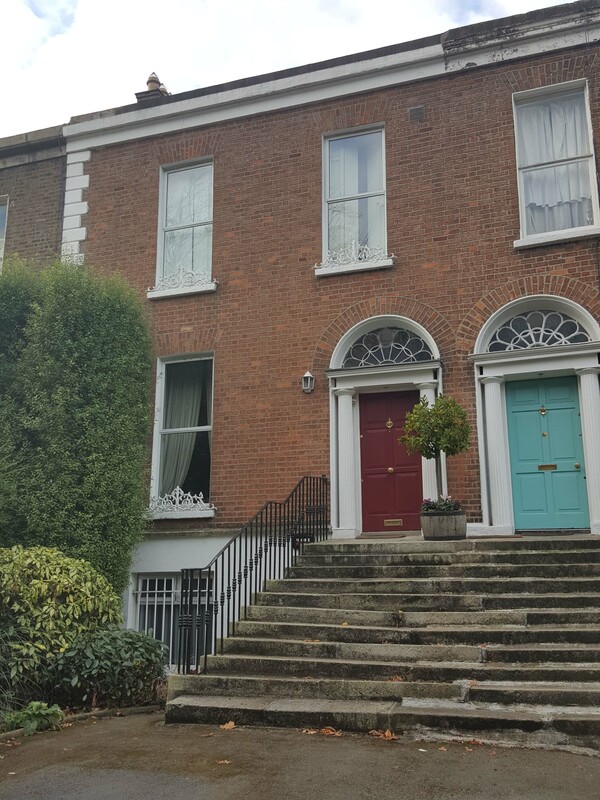 The main purpose of the works was to replace the crazed, cementitious render to the rear elevation with a lime render to allow the wall to breathe. An Otterbein NHL 3.5 lime was applied. 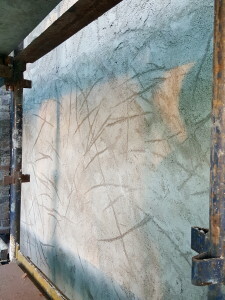 The builder’s experience taught him that rather than scratching the base coat in the traditional way, using the edge of the trowel to randomly score the surface of the lime provides a better key for the top coat, with less “dragging” of the lime beneath, leaving a more uniform finish; just one of the many joys of working with experienced builders. The final product is a warm, inviting facade that more importantly will protect the integrity of the rubble limestone walls for years to come (that’s right, they’re not brick– imagine our surprise when the cement came off)! The scaffolding allowed us to take a better look at the roof, where it was found that the valleys had been improperly flashed, allowing driving rain and Ireland’s unforgiving climate to cause damage to the internal plaster. One of the copper valleys was replaced as a matter of urgency, but the front parapet valley will require a larger scope of work than can be safely done in winter. Most exciting has been the replacement of the aluminium windows with timber sashes of historically-accurate fenestration pattern. Every detail, down to the size of the sash horns to the profile of the glazing bars, is consistent with historic traditions. One look at the before (left) and after (right) images shows what a difference windows make in the character of traditional buildings. The front door was also replaced in the 1970s, evidently with an off-the-shelf feature that is both too narrow and too short for the door ope. The ill fit was partially responsible for the wet rot to the ground floor joists bearing into the front facade. The front door is currently being replaced with a period-appropriate door with four recessed panels and a central, vertical bead as would have been seen in the early Victorian period. 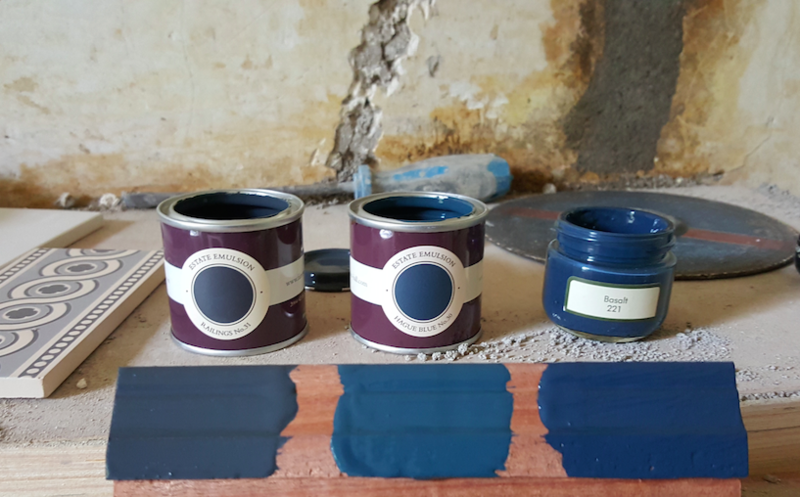 Both the windows and the doors will be painted with Farrow & Ball’s ‘Railings 31′ before works end. 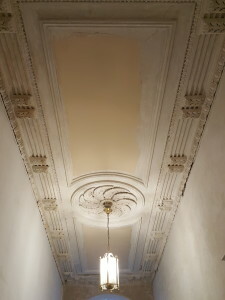 A refurbishment project would be nothing without surprises, like when we discovered that the stairwell ceiling had been replaced with double-slabbed plasterboard that not only did not meet the rising walls but that had also not be fixed to the decorative cornice, allowing it to sag and crack along the junctions. To remedy this, the cornice was propped and the plasterboard was carefully replaced, with new sections acting as battens to which the cornice was secured. The entire flat ceiling was then skimmed with lime putty. Like the timber stud partitions at the lower levels, the boast plaster on the Study ceiling was also secured to the timber lath with stainless steel washers. Other elements like cross-connected hot and cold water pipework, a faulty Immersion, and un-earthed electrical services were remedied as the project progressed. After all, expert craftsmanship is moot if a house is not both safe and functional. Now we have ensured both. Exquisite wool carpets by Louis De Poortere, Axminster and Guildhall Twist, and Victorian tile by Telford will shortly be introduced throughout, along with a runner on the recently cleaned and repaired staircase. 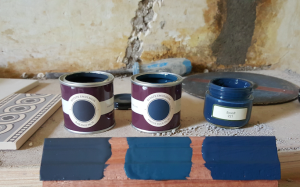 A palette of warm stone hues including Zoffany’s Quarter Paris Grey and Half Linen, along with Farrow & Ball’s Skimming Stone and Elephant’s Breath will be set off by the warm white of Milk Teeth by Colourtrend on all architraves and joinery. A feature wall comprised of a floor-to-ceiling bookcase in Coloutrend’s Peacock Blue may just be the piece de resistance, and a much-needed reference point for an enriched Oriental rug. 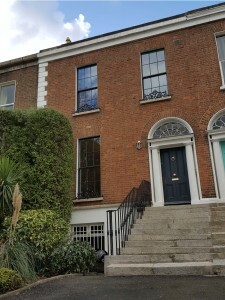 Little touches like a salvaged Edwardian sink and new light fittings will form the final touches on a revived townhouse in the historic heart of Dublin. Stay tuned in early 2018 for final photos after the scaffolding comes down and all internal decorations are complete. This diamond is nearly ready for its black box reveal! Happiest of New Years to you all!